Does the paint on your interior walls look drab and dingy? Are you looking for a way to add personality to your home without spending thousands of dollars remodeling and decor? Do you have a new baby on the way and a nursery to prepare? If so, interior painting may be the answer. Once you've decided to paint, the next step is to find a local painting contractor you can trust. In the painting industry for over 4 years, Palmer Pro has earned its reputation as an industry leader. The simplest way to revive your home's interior without a huge amount of effort, interior painting covers flaws, makes space feel fresh and gives "welcome home" a whole new meaning. Call today for a free estimate: (832) 410-1868. A messy paint job is almost impossible to repair and can have a negative impact on the value of your home. Fortunately, it's not a risk when you work with Palmer Pro. With a dedication to quality and precision, proper preparation is at the basis of each and every painting job. All surfaces and furnishings are carefully prepped before the job begins. This produces crisp lines and great results. While a new coat of paint can hide minor drywall damage, most damage must be repaired before painting begins. Luckily, Palmer Pro offers drywall repair for any damage you may have in your home. All dings and cracks will be properly filled, sanded and sealed. 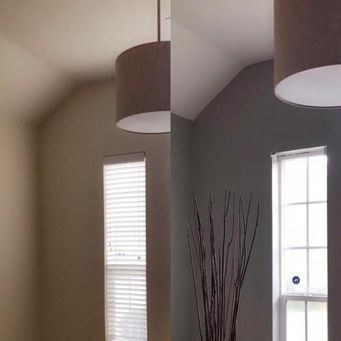 For quality interior painting, look to the experts at Palmer Pro and put our 4 years of experience to work for you.